22-count congress cloth, 6" x 6"
The schematic below defines the different stitching areas. Each area is identified by number and letter. The number indicates which stitch to use; the letter indicates the color of the metallic thread used as an accent. When stitching with 6-strand embroidery cotton, use the number of strands that is comfortable for you. Working on congress cloth, I use 2 strands for diagonal stitches and 3 strands for upright stitches. Depending on your tension and ability to lay threads, you may need to add or subtract strands. If you are not happy with the way your stitching looks, change the number of strands. Make sure you use your laying tool to keep the individual strands flat and untwisted. 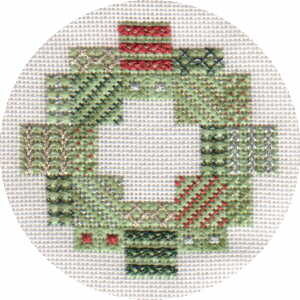 Some of the stitches are rotated 90° from the charts below to provide continuity of line throughout the design. This is noted in the stitch description. Please refer to the color picture for the proper orientation. To begin, find the center of the canvas and count 6 threads to the right and 18 threads up. This is the upper left corner of the 1Go area. Click on the name of a stitch for detailed directions for working that stitch. Work the areas with gold and silver metallic as charted. Rotate the chart 90° when working the areas with red and green metallic. This stitch is worked with two needles simultaneously. Work one row of diagonal mosaic (black lines), then a row of tent stitch (gray lines) to frame it. Continue with the next row of diagonal mosaic, and so on. The charts below start with the longest row first. This is so you can get familiar with the stitch before you have to start compensating. If you're comfortable with compensation, you can start in one of the other corners. Work the areas with red and green metallic as charted. Rotate the chart 90° when working the areas with silver and gold metallic.